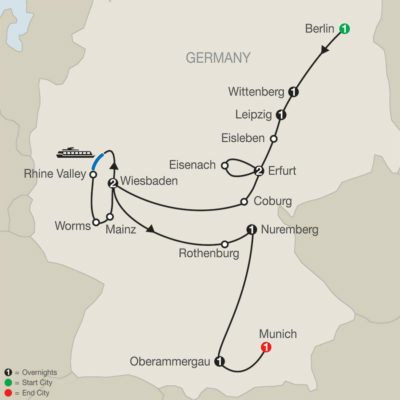 Walk in the footsteps of Martin Luther on this Germany vacation highlighting the European Reformation and featuring the Oberammergau Passion Play. 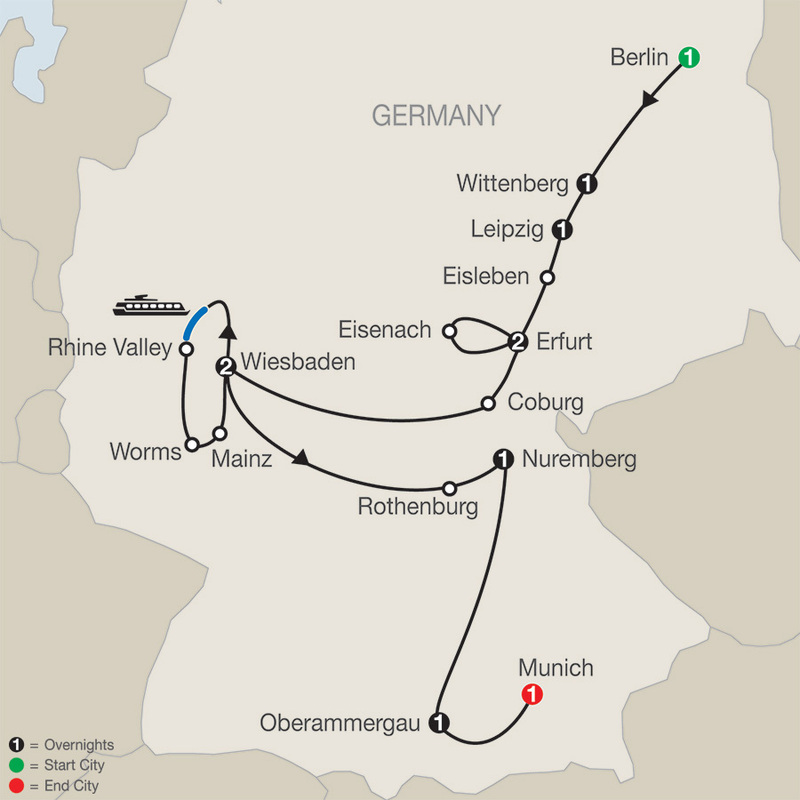 You’ll overnight in Berlin, Wittenberg, Leipzig, Erfurt, Wiesbaden, Nuremberg, Oberammergau, and Munich, and you’ll visit Eisleben, Eisenach, Coburg, Worms, Mainz, Rothenburg, Augsburg, and the Rhine Valley along the way. On this faith-based tour, you’ll visit many of the sites important in Luther’s life. In Wittenberg, visit St. Mary’s Church, where Luther preached reform, got married, and baptized his six children. Also visit Luther House, where Luther and his family lived. In Eisleben, visit Luther’s birth house and death house museums, both UNESCO World Heritage Sites; St. Peter & Paul Church, where Luther was baptized; and St. Andrew’s Church, where Luther preached his last sermon in 1546. Visit the Augustinian Monastery in Erfurt, where Luther lived as a monk, and Coburg Fortress in Coburg, where Luther was protected during the Imperial Diet of Augsburg in 1530. In Eisenach, visit the house where Luther lived; Wartburg Castle, where he lived in disguise as “Knight George;” and St. George’s Church, where he was a choir boy and later preached. In Worms, visit the Reformation Monument and the cathedral where Luther presented his case. These are just some of the many highlights included on this faith-based, Germany tour. You’ll not only see these amazing sites, but you’ll also be accompanied by others desiring an inspirational journey and a Tour Director committed to bringing you these inspiring places. It’s a vacation you can believe in and one sure to leave you with many memories of a lifetime! Please call for single and triple occupancy. 10 nights in deluxe hotels, close to city centers. Full buffet breakfast daily and eight three-course dinners with wine. Boat cruise on Rhine River. Free Wi-Fi on motorcoach and in most hotel lobbies.